A few times now, I’ve wondered just how many degrees of separation there are between people who visit New Zealand’s back-country. Maybe a few people know nearly everyone, and the whole network is very closely connected. Maybe there are geographically localised networks. People: Steve, Megan B, Hans, Christine, Kevin and me. Planned route: Up past Cone Saddle, over Cone and down to Neill Forks for Saturday night. 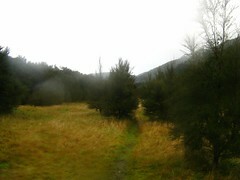 Then back up and around Totara Flats, back towards the road. Actual route: Straight to Totara Flats for Saturday night, up over Cone and back to start. We chased rainbows through the roads of the Wairarapa, and rain finally began to come down on us as we arrived in the parking area at the road-end of Walls Whare. There’s a nice camping area here, but it’d be somehow silly to use it this time given we were arriving at around 9.30am on a Saturday morning. Being a trip organised on behalf of our trampey club, our group consisted of Steve, myself, Megan, Hans, Christine and Kevin — a chap who mostly goes out with the Alpine Club whom Christine had managed to rope in on short notice. Apart from Christine, none of us had met Kevin before, but going tramping with people is a great way to meet people. Our intent was to get in to Neill Forks Hut for the evening, which I was looking forward to because I haven’t been there before. We shared our van with another trampey club group of people coordinated by Megan S, and their idea was just to walk to Totara Flats alongside the river, stay for the night and walk back. As we drove up a couple of TTC members were about to leave, taking a retired Search and Rescue dog for a walk in to Tutuwai and back to Cone. 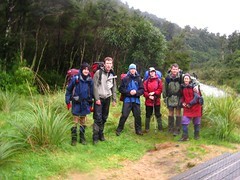 This was good weather for tramping, despite the rain setting in. As often happens, I took a little while to get my things sorted, and eventually found myself running over the swing bridge that crosses the Waiohine Gorge, flapping around as I sorted out my pack, camera now firmly attached. The others were waiting on the far side, having been away from the van two or three minutes before myself. We all left the far side as soon as I arrived, heading along the relatively obvious track and hoping to soon be at Cone Saddle. I had a strange moment there glancing at the end of the bridge, wondering if maybe everything wasn’t quite right. It was just a little rain . . . great tramping weather. As the minutes wore on, we discovered that Kevin wasn’t so unknown to us after all. Soon after we left, Hans had an enlightened moment where he exclaimed something like “ah, you’re that Kevin”. It turns out they’d anonymously come across each other a few weeks ago. Within twenty or thirty minutes we’d spread out somewhat. It wasn’t a bad track, actually, gentle sidle above the Waiohine moving in and out of the trees and with the occasional view out over the Waiohine below. That was the problem, actually, and maybe why something hadn’t seem quite right. We weren’t going up, and surely we shouldn’t be anywhere near the Waiohine at all. Kevin, Christine and I found and consulted each other near the back of the group, wondering if there was something wrong. Pulling out and checking a map, it became apparent that yeah, we certainly shouldn’t be where we were. Oops. A minute or two of continuing and we soon caught up with the others, who were having similar thoughts. This was certainly a problem, and it was about now I had one of those enlightening “ah yeah” moments, during which memories flooded back of the three previous times I’ve been to Cone Saddle. On every one of those occasions, the track went straight up a spur leading directly off the end of the bridge. The most recent time hadn’t even been that long ago. Some quickly performed in-the-head logic suggested that the track junction we were after would probably have been exactly where it was a year previously, which was more or less where we’d started from. Somehow we’d wandered off the end of the massive Waiohine Gorge swing bridge and missed a major junction. As an aside, I’d like to note that some people would call this a “navigation” error, and possibly even an idiotic and embarrassing one. I wouldn’t. If you never tried to navigate, it can’t possibly be a navigation error, after all. If anything it was just a small mis-judgement of vectors that mis-placed us a little. Consequently instead of directing ourselves towards Cone Saddle and eventually Cone Peak (which should have been more vertically inclined), we were gracefully sidling towards Totara Flats. Our first order of business was to decide how to avoid embarra creating disorientation and confusion for other groups of people enjoying the range. Obviously back-tracking to walk straight into Megan S’s group behind us was out of the question — they would have been very confused, possibly even dying of confoundedness on seeing us re-appear. Assessing our situation, we could probably divert up an alternative route to Cone Saddle, the base of which we’d yet to reach, but it’d be a big diversion that would take longer. In the end we decided to press on to Totara Flats, and possibly continue up and around the long way to Neill Forks Hut if we had time. Even if we stayed at Totara Flats, we’d have a while to get our story figured out before Megan and co showed up. Kevin and Megan at Makaka Creek. Pleasant Tararua rain continued to fall, but not so much as to flood the side creeks and prevent us from getting to our newly chosen destination. We wore raincoats, but were also under trees in general. 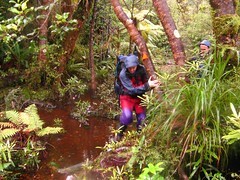 Exposure to wetness was only average for the Tararuas. Good tramping precipitation. The route this way towards Totara Flats has at least a couple of significantly sized side-creeks that may flood dangerously — Clem Creek and Makaka Creek (aka Long Flat Creek), although neither was very full at this point. 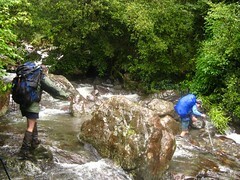 The main Waiohine River was high enough, however, for us to decide on the high water route around the slip two thirds of the way along. Having a hill to climb was rather a nice change, even if it was only for a short distance. The far side of the slip leads into a third creek on the southern end of Totara Flats, unnamed as far as I know, which is also prone to flooding and I’ve seen it in the past in a state which I wouldn’t enter it, but today, as we found on reaching it at about 12.30pm (three hours after starting), it was still perfectly crossable. old hut towards the back left. We eventually drifted along the approximately 2.5 kilometre length of pretty river flats, sparkling with lively grasses and generally photogenic as places often are in the rain. The site of the old Totara Flats Hut lies part way along here, towards the back of the flats in a raised section. It was moved a few years back due to a determined flooding risk, I think, and is now reduced to a few sheets of corrugated iron left in the trees. The area now seems to make a popular campsite, being raised above the rest of the flat. The naming and positioning of Totara Flats Hut can be confusing when comparing different maps. Some maps label the now-missing hut as the “new Totara Flats” hut, as it was new when it was built as recently as the 1970s. The really new (and current) Totara Flats hut is back where the very old Totara Flats hut used to be, a few hundred metres further north, opposite the confluence between the Waiohine and Totara Creek, and very close to the bridge over the Waiohine. Some maps still label the location as the “old” Totara Flats hut, including the map on my GPS which is based on late-1990s data from LINZ. 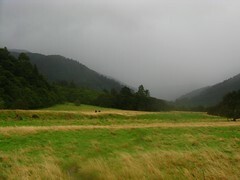 Within a minute or two of us walking into Totara Flats Hut, the rain started persisting down with real cats and dogs force. Perhaps it was just the verandah amplifying the rain. 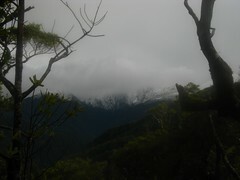 Still, overall, a good Tararua day and great tramping weather. We’d walked in at about the same time as a trio of people from the Hutt Valley Tramping Club, who’d come from the Holdsworth Road end, and had a chatter with them. It turned out Kevin knew a couple of them really well through the alpine club. By now it was lunch time, but we still needed to decide what to do from here, and if necessary get our story figured out before the others showed up. Being situated in a large cosy hut like Totara Flats with rain hammering on the corrugated plastic roof does strange things to people’s judgement which are sometimes difficult to understand. Weighing the prospects of staying against the prospects of continuing towards Neill Forks, possibly walking the final hour in the dark (being a week or so before the shortest day and everything), we elected to sacrifice travel in the good tramping rain and remain here for the night. Kevin’s declaration that he’d been to Neill Forks a few weeks before, and that it was a dank and soppy hole in the ground, or something to that effect, sealed the deal. His description reminded me of an entry I’d seen in the book at Powell Hut on the late Saturday morning of a few weeks before, of a group that’d left to go up Holdsworth in yucky weather before heading down to Neill Forks. Okay, so he was that Kevin, as I confirmed with him. I guess you quite often run into the same people in the hills. With the decision now made, I quickly snatched my favourite Totara Flats bunk, which is the top level bunk next to the window overlooking the Waiohine River. Last time I was here I’d spent some time gazing out the window waiting to see a large tree or two floating past. 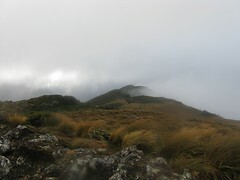 That had been great Tararua tramping weather, too. This time we’d not had as much rain as last time. Steve also hovered towards the bunk room, but in his case it was to hide himself away in his sleeping bag for a snooze. We waited and waited for Megan S’s group to show up, and as time went on Christine eventually roped us all into helping with her crossword puzzles, which took a while. I read a few more pages in my book, and as we waited we were joined by another single person from the direction of Walls Whare. It turned out she was someone Steve knew through his work, and I guess the degrees of separation are rather small in the tramping world. The Waiohine went up and down with the showers, rising and falling, speeding up and slowing down very noticeably during the several hours as we waited. One of the Hutt Valley club guys was paying close attention to it, and kept us updated as to the state of the marker rocks he was watching over in Totara Creek as it poured into the far side of the Waiohine. In the space of a few hours, Totara Creek rose by perhaps 30 centimetres, and then dropped by the same amount. The main river was certainly full enough to be a dangerous crossing for the whole time we were there, but not as flooded as it could be. Earlier as we’d coasted along the flats, I think I’d been able to see the stones below the water within a metre or so of the river’s edge. I suppose there probably hadn’t been enough rain in the past few days to fully saturate the soil, and the river levels were much more reactionary to heavy showers passing over the catchment than they would have been after a few days of persistent rain. As for getting our story straight, we didn’t really. I think it was some kind of justification about having decided to come this way around our loop in case the creeks were flooded by the following day. Whatever it was, it was enough to satisfy Megan S and her associates. They showed up about three or four hours after we had, having coped with some higher side creeks, I suspect. They weren’t too late to help with some of the harder parts of the crosswords. Before long we were chopping veggies, figuring out how to open tins of tuna without a can opener, and eventually Steve slunk out of bed and cooked a nice Green Curry meal, which was topped off by some kind of cream and apricot on ginger cake dessert whipped up by Hans. Good food by all accounts. I took a look outside and counted three stars in various directions, generally through cloud, and the rain continued to clatter on the corrugated plastic verandah. On announcing the stars when I returned indoors, Kevin raced outside appearing quite enthused, soon returning with a muted look of disgust on his face. Maybe I hadn’t been descriptive enough. I slunk into bed at around 8pm, I think. It was dark out side and the rain continued to clatter on the roof. Classic tramping rain. Me, Hans, Steve, Megan, Kevin and Christine. We’d discussed our options for Sunday, which amounted to either walking out the quick way (side-creeks allowing), or following around the loopy way up to and along Code Ridge. The second option had won convincingly, with nobody really wanting to go back the way we came, and we estimated it’d probably take about 7 hours looking at the topology and using standard group timing metrics. It was about 9am by the time we left, after a relatively casual pulling together of things. I’m fairly sure Steve would have won any competition of the most sleep at Totara Flats that weekend, having clocked up around 16 hours as we figured out. He must have been very tired, but didn’t hold anyone up. I killed some time as people got ready by going out to find some firewood, having felt somewhat guilty about not having contributed much to the HVTC people’s effort to keep the fire going the previous evening. Christine clambering around the track. During our climb up to Cone Ridge, which starts steeply, the rain continued. It looked as though it could be rather cold higher up, but I was one of the few to take a gamble and stick with only wearing my shorts, and no thermal long-johns just yet — I sometimes find I can get very uncomfortably hot otherwise, I guess. Cone Ridge becomes a more shallow climb at around 600 vertical metres, and in several places we found ourselves clambering around small ponds and bogs that had collected on what might normally have represented a track. Two hours after we left, we passed the turn-off that would have led down to Neill Forks Hut, but nobody felt like running down the hill to take a photo proving we’d been there. An hour later we found a smidgen of snow, indicative of the relatively cold temperatures at this higher elevation. We were sleeted on through the trees as we approached Cone, and I finally caved in and got my overtrousers and balaclava on. It wasn’t windy, though. Just great Tararua weather. As we approached the wacky antenna thingee on Cone some time after midday, which the most obvious route avoids by about 100 metres, the sleet even let up and allowed us to see some of the surrounding range in relative comfort as it hovered in the midst of the glinting cloud that settled in the valleys. Still quite cold, and kind of murky, but also very cool. It was nicer than last time I was here, when the wind chill made things less comfortable. We celebrated, each having a toffee pop. 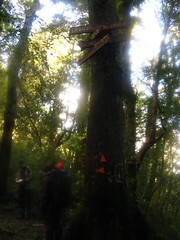 Cone Peak (1080m) lies just above the bush-line, and the three-way route junction is marked by a standard 3-way DoC signpost. I was the last to head back down into the trees, and took a minute just for myself. Looking towards Alpha, Aston and Hector. The track from Cone Peak down to Cone Saddle is a fairly normal walk down a spur in the Tararuas, offering the occasional vantage point to gaze out towards much higher peaks such as Alpha and Aston and Hector to the west. That part of the range, up to 500 metres higher than Cone, was well covered in a white blanket of snow, and made a good sight despite also being blanketed by cloud. 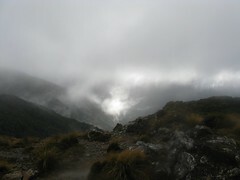 As we descended, Kevin explained how he was now up to his seventeenth day in the Tararuas, and had been rained on every time. This contradicts my own experience. Still, I think we’d timed our visit to Cone Peak nearly perfectly despite the amount of rain. The cloud had parted, albeit briefly, during the short time we’d spent above the bush-line and had made for a relatively pleasant visit. Awesome Tararua Weather. With the rain holding off, I even managed to remove my raincoat for a while. There are a couple of notes about this particular spur that come to mind, from Cone Peak down to Cone Saddle. The first is that I was in a group where we saw a kaka screeching and flapping in the trees around here a couple of years back. By itself this would not be significant because I’m sure kakas get to many random places, and they’re known to live in the Tararuas. I think someone up the front of our group on this occasion also mentioned seeing a kaka, though, so perhaps there’s a kaka or two that especially likes this region. The second note that comes to mind is that although my relatively modern map only shows the two “official” maintained tracks down to Cone Hut… the first directly off Cone Saddle and the second from slightly further down… Kevin’s map showed a third track labelled as the Block XIX track, heading down the spur from spot-height 812 directly towards Cone Hut. I forgot to look out for the likely starting point of this route, but it could make a fun navigation exercise some day. Cone Saddle is easily recognisable. We re-grouped at Cone Saddle at 1.30pm or so, an hour after our visit to Cone Peak and probably about 4 horizontal kilometres of travel back to the Waiohine Gorge bridge. Cone Saddle is within reasonable reach of a Friday night walk, which was nice to know for me at least. As we dropped further, nearing the road, the weather situation changed quite suddenly. Within minutes, the ambience of light below the tree canopy dramatically diminished, and soon more rain set in. This was a fresh southerly front finally on its way through, but fortunately not one we’d need to spend a lot of time enduring. Overall we spent about 2 hours getting down to the road from Cone Saddle, a journey that becomes fairly steep and slippery near the bottom. We emerged at the bridge from the opposite direction to where we’d headed the previous day’s morning, somehow amused to re-discover the track junction we’d walked straight past, and quickly made our way back to the van where Megan S and three others had been waiting for about 90 minutes. It took us about 6.5 hours in the end, so thankfully our estimate hadn’t been too far off. There are many things I think I enjoyed about this trip. 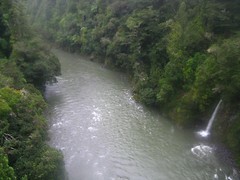 I was able to see the Waiohine River, one of my favourite Tararua rivers, in relative flood once again. I still haven’t seen it much close-up out of flood, and maybe that’s one of the reasons I like it so much. I also got to climb up a hill, which was fun and rewarding as usual. Oh, and I’ve now met Kevin, which seems to put me less degrees of separation away from knowing many more people who visit the back-country. 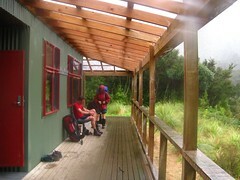 This entry was posted in tramping and tagged bagged:totara flats hut, change of plans, rain, tararuas, tramping, wellington tramping and mountaineering club. Bookmark the permalink. Dont worry Mike, when Mark and I went in to Totara Flats the week before you, we stopped at the end of the bridge and found ourselves in a muddle because there were NO signs, and the tracks themselves werent that obvious dissapearing into the trees unless you knew roughly where they should be! 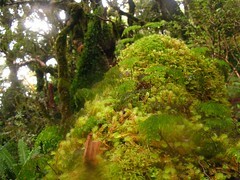 Megan S, of course, had done Totara Flats the weekend before us, and had taken about 8 hours that day. I gather her group took a similar time to get in on your weekend – given I added up your trip to be about 3.5hours? and hers another 3-4 behind?